Rose Acre Farms installed both wastewater and storm water constructed wetlands to provide environmentally sound water treatment, while reducing operating and maintenance costs. Shown above: Rose Acre Farms several days after project was completed. 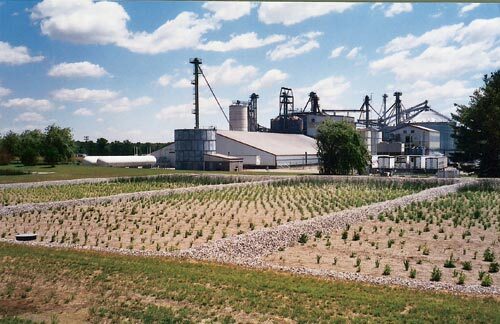 Rose Acre Farms, headquartered just west of Seymour, Ind., operates a soybean meal processing plant and is one of the world’s largest egg production operations. Founded in the 1930s, approximately 75 percent of Rose Acre’s egg production is used for fresh table eggs. The remaining 25 percent is processed into a variety of fresh liquid, frozen and dried egg products. The company is well respected for the quality, value and freshness of its products, and prides itself on its commitment to environmental stewardship. Among Rose Acre Farms’ goals are staying ahead of environmental regulations, being a good neighbor, and leaving things cleaner than how they found them. So when it came time to address storm water runoff and wastewater treatment at its soybean meal processing plant, which processes eight million bushels of soybeans a year, the management team at Rose Acre Farms directed its attention to a unique, environmentally responsible method of treatment: constructed wetlands. 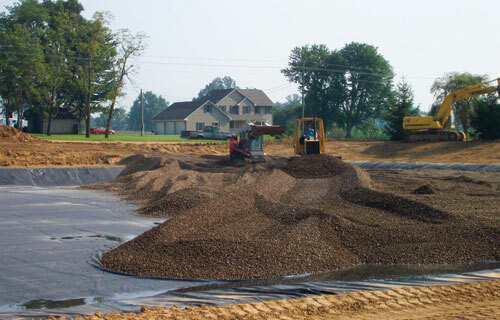 In the past, Rose Acre Farms’ wastewater had been handled solely by a package treatment plant. Although the system worked well enough, it was high maintenance and operationally intensive. For storm water treatment, Rose Acre previously used septic tanks to treat runoff generated from the five-acre soybean processing plant and a maintenance garage. But in times of heavy rains, the runoff was so extreme that water and bean husks filled ditches around the property and nearby roadways. Researching various options for the best solution was the responsibility of Natural Concepts Engineering, Inc., a water quality engineering firm located in Indianapolis. According to Tony Wesner, executive vice president and manager of environmental affairs for Rose Acre Farms, Natural Concepts constructed a couple of pilot wetland projects for Rose Acre on a much smaller scale and one sizable system at the company’s hatchery. Although constructed wetlands are a fairly new method of water treatment in the United States, these systems have been widely tested and used in Europe since the 1960s in a variety of applications. Advantages to using an EPDM rubber liner include conformity to odd shapes and ease of installation. Regulatory requirements for projects of this nature vary from state to state, and also vary between storm water and wastewater wetlands. 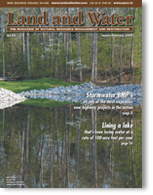 For the water constructed wetland, Rose Acre only had to modify their storm water management plan to reflect the addition of a constructed wetland. In August 2005, however, IDEM announced a new regulation to monitor groundwater contamination that will be enforced beginning in August 2006. This regulation will require industrial dischargers to collect quarterly water samples and send them to a lab for analysis. Rose Acre currently is training its personnel on these procedures. 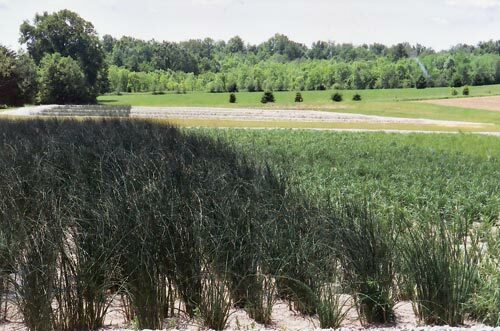 In Indiana, where Rose Acre Farms is located, two government agencies regulate constructed wetlands: the Indiana Department of Environmental Management, and the Indiana State Department of Health. In terms of testing and reporting for the wastewater constructed wetland, there are 10 areas in which IDEM requires monthly reporting: 1) temperature of discharge; 2) oxygen level; 3) pH level; 4) total suspended solids; 5) oil and grease content; 6) ammonia level; 7) chloride level; 8) BOD level; 9) average discharge per day for the month (in gallons), and maximum high for the month; and 10) total monthly discharge. Rose Acre is diligent about these reporting practices, but Stout said it is no more time consuming than with the conventional wastewater processing system. 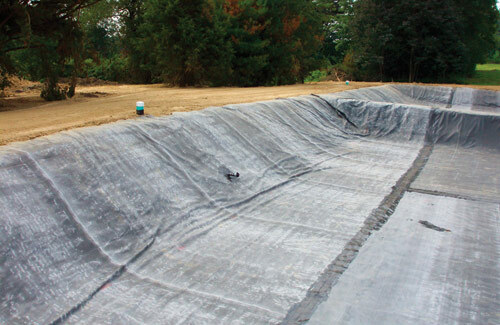 After minimal training from a company representative, Rose Acre Farms was able to install the liner themselves. Based on Rose Acres Farms’ requirements at the soybean meal processing plant, Natural Concepts determined that the optimal solution for the farm’s storm water and wastewater treatment was to install side-by-side subsurface flow constructed wetlands about 200 yards from the plant, according to Mark Harrison, project engineer for the engineering firm. Two separate units were built approximately 30 feet apart. The storm water treatment wetland covers 0.6 acres and is served by two pump stations having a combined capacity of 1,900 gallons per minute. Vortex pretreatment units precede the pump stations for solids removal. According to Wesner, an average of 100 semi-trailers come through the soybean plant every day during the fall of the year. These trucks are covered in grain dust, which collects on a large blacktop driveway. When it rains and washes off the drive, there is the potential for a lot of polluted water leaving the property. Rose Acre was concerned this could be an environmental matter for its property, as well as a concern to neighbors, if not properly addressed. Rose Acre Farms’ previous system, according to Wesner, was very unforgiving in terms of being able to address fluctuating levels of incoming water. Wetlands, conversely, are not sensitive to these changes and provide better results day in and day out. The wastewater treatment wetland was designed as a pretreatment system for the existing water treatment plant. This wetland covers 0.9 acres and has an average daily design flow of 30,000 gallons per day. In contrast to storm water, wastewater runoff occurs at a fairly steady pace and, therefore, the treatment process also occurs at a more fixed rate. In general terms, a subsurface flow wetland consists of a basin, sometimes called a “cell,” that is lined with a barrier to prevent seepage. The basin is then filled with gravel to support the root structure of aqueous vegetation, which is planted directly into the gravel. The plants then translocate oxygen down to the roots through the plant. This oxygen forms aerobic areas that sustain bacteria and other microorganisms that live in the gravel and root zone. The bacteria do all the work of removing the pollutants in the water. Moreover, the sun is the only energy source used to treat the water. During winter months when plants move into a dormant phase, the roots remain active and the oxygen transfer remains steady. Therefore, the system performs just as efficiently in sustained cold temperatures. In general terms, a subsurface flow wetland consists of a basin, sometimes called a “cell,” that is lined with a barrier to prevent seepage. The basin is then filled with gravel to support the root structure of aqueous vegetation, which is planted directly into the gravel. Moreover, because there’s no standing water in a subsurface flow wetland, there is almost no likelihood of producing mosquitoes, and odor is not a factor. Lining the wetlands with an effective barrier to prevent seepage into groundwater supplies is a crucial part of any constructed wetland project. Additionally, the lining product maintains the appropriate water level in the cells—just below the top surface of the gravel. Natural Concepts had used a variety of lining materials prior to the Rose Acre project and specified PondGardâ EPDM Rubber Liner from Firestone Building Products Company based on its performance advantages. In fact, the liners are so easy to use that Rose Acre Farms installed it themselves with minimal training from a Firestone representative. Rose Acre was able to use most of its own construction equipment to dig two rectangular cells. After digging the two cells, Rose Acre utilized skid steer loaders and rubber-tired pay loaders to assist in stretching the lining material out across the cells. Once the material was in place and the seams were welded, loaders and earthmoving equipment were used to fold the dirt over the perimeter of the liner at the top edge of the basin to hold the material in place. Rose Acre Farms is convinced that constructed wetlands are an environmentally responsible, economical and low maintenance option. Shown above: Photo taken one year after completion. After installing the lining material and filling the cells with gravel, Natural Concepts planted nine varieties of flowering and non-flowering wetland plants indigenous to Indiana. According to Harrison, both the wastewater and storm water constructed wetlands met the farm’s objective of providing environmentally sound water treatment while reducing operating and maintenance costs. “This system uses no motors, whereas most water treatment options are mechanically intensive. Constructed wetlands use only plants and sunlight to accomplish their purpose, and no harvesting of plants is necessary (which would be a major operational cost) in order to maintain proper levels of biological activity,” he said. The absence of pumps and other mechanical equipment translates into greatly reduced utility bills and no need for special training of an operations staff. Additionally, constructed wetlands handle variables much better than traditional, operationally intensive forms of water treatment. If there’s a power outage, there’s no concern that the system will shut down. If there’s a torrential rain, there’s no concern the treatment plant will become overwhelmed. As an added benefit, building the constructed wetlands prevented Rose Acre from having to expand its wastewater processing system due to Storm Water Pollution Prevention Plan guidelines. For more information, contact Firestone Specialty Products, Bill Johnson, Field Sales Engineer, 310 East 96th Street, Indianapolis, IN 46240, (800) 428-4442, (317) 575-7100 or JohnsonBill@firestonebp.com. ©2006 - 1998 Land and Water, Inc.